When searching for a mouse that fits completely into the hand, almost like a glove, there are ergonomic options. Named after the same concept, the Handshoe Mouse is designed to fit optimally into user's palms to allow for better navigation, sans the wrist and arm strain left behind by traditional mousing. 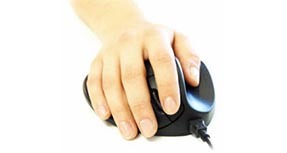 The Handshoe Mouse is currently only available in a right-handed orientation. 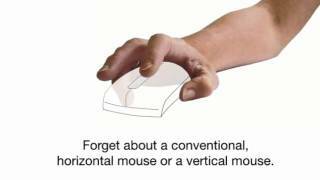 After months of pain in my left wrist and hand, and weeks of therapy to regain strength, my boss found your website, measured my hand and ordered a left handed Handshoe mouse for me to try. After using it at work, I had to buy one to use at home. It has been over three months since I began using these mice, and I wholeheartedly endorse your product! I keep telling everyone I know how comfortable the Handshoe Mouse is to use and how it relieved the pain in my wrist and hand. Thank you for a great product. First off - this mouse does take some getting use to. It has been about a month and I'm still adjusting, but my overall arm and wrist feel much less strained/tight after a long day of precision clicking in Adobe InDesign. The "death grip" I used to have on my old traditional style Microsoft mouse is gone and that alone was worth the cost and adjustment period! Overall 4/5 stars, 5/5 if my pinky could have gotten used to the design of the mouse sooner! I measured my hand as instructed and it said I needed a Medium mouse. I ordered it and it was too small. Returned it and got a Large. The mouse is better than a standard designed mouse. Your hand is spread out flat rather than clenched. 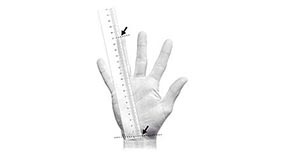 It reduces the pain from carpal tunnel syndrome but is not 100% effective in doing so. I may have other positional problems contributing to my discomfort. You have get used to the mouse but it doesn't take long. If you are going to buy just 1 mouse this is a better design than a standard mouse. It would be nice if you could program the buttons. Rated a 4 because of continuing wrist pain but this may not be the fault of the mouse. As ergonomic as it gets! Take my word for it. I have suffered through using several dozens of standard mice, "natural" and other ergonomic mice. NONE come any to the comfort of this mouse. I originally tried to buy this mouse on the "Big river" store, but they weren't selling the latest model with light click. I have also tried the Evoluent vertical mouse 4, it was giving me arm cramps and the hand doesn't feel relaxed as you constantly have to pinch your thumb to maintain grip. This mouse keeps my arm, the hand and the grip completely relaxed. Wish I had gotten this mouse sooner. I am totally happy with and I highly recommend it. My other recommendation (ergo keyboard): Kinesis Freestyle Ergo with 20 inch separation. $99.00 List Price: $119.00* The list price is the same as the MSRP (Manufacturer's Suggested Retail Price). It may not necessarily be the price at which the product is sold.